Thirty first of every August is ‘African Traditional Medicine Day’ but how many know about it? Over a span of about 150 years three members of my family have practiced medicine. My grandfather, my brother and I have all at one time or another provided medical care to the needy, all of us receiving acknowledgements from our patients and society. However, that is about where the similarities cease, for with the coming of the colonial power to our lands my grandfather’s practice became severely restricted and despised. Generally, he practiced in secrecy from then on. On the other hand, in the case of my brother and I who were trained in ‘scientific medicine’ by the colonials, our practices were legitimised by stints in the ‘motherland’ as well as being registered by professional regulatory authorities. In all countries of the world there exists traditional knowledge related to the health of humans and animals. The World Health Organization (WHO) defines traditional medicine as “the sum total of all the knowledge, skills and practice, based on the theories, beliefs, and experiences indigenous to different cultures,whether explicable or not, used in the maintenance of health as well as in the diagnosis, prevention and elimination of physical, mental or social imbalance and relying exclusively on practical experience and observation handed down from generation to generation, whether verbally or in writing”[i]. This definition applies to all traditional systems of medicine whether in Europe, India, China or Africa. Yet whereas European missionaries and colonial administrators left alone, sometimes even encouraged, traditional medicine in India and China, they almost violently discouraged African traditional medicine. In particular, the intricate relationship between African medicine and African religion[ii] made traditional medical practices key targets of attack by early European Christian missionaries, who considered many African traditional religious rites and rituals to be against Christian teachings and morals. Traditional healers were regarded as heathens because of their participation in African Traditional Religion. The medicine my brother and I practice derives from the germ theory of disease (see below) while my grandfather’s traditional African medicine is based on concepts that are much broader and holistic. In traditional African societies it is believed that good health, disease, success or misfortune are not chance occurrences but arise from the actions of individuals and ancestral spirits according to the balance or imbalance between the individual and the social environment. African traditional understanding was that sickness was a kind of punishment by the spirits of the ancestors to those who do not observe the rules of good social behaviour, from whom the ancestors withdraw their protection leaving them exposed to the whims of evil spirits who cause physical and mental dysfunctions. Traditional healers use plants in a variety of ways, depending on the illness to be cured. Parts of plants can be applied directly to wounds and cuts or, if necessary, prepared as powders, infusions, or even used in the form of smoke or fumes. African herbal medicine is often associated with magic[iii], for example the prescription of amulets and charms as prevention or treatment of diseases. Today, many Africans including some self proclaimed Christians, and especially politicians, consult a traditional healers for advice on various issues, including health-problems. The African traditional ‘doctors’ have skills in both herbal remedies as well as in spiritual healing, the latter involving various traditional religious rites and rituals. In this regard, African medical practice is holistic- it takes into account all of patient’s physical, mental, and social conditions in the treatment of illness. The Germ Theory of disease is the foundation of modern (western) medicine and was an important basis for innovations such as antibiotics and hygienic practices. Germ theory was validated in the late 19th century, thanks to the works of Louis Pasteur (1822-1895) and Robert Koch (1843-1910). It proposes that microorganisms are the cause of many diseases. Hence management of the disease is focused on establishing which microorganisms are responsible and applying specific drugs (antibiotic) for their elimination. Modern medicine is also referred to as Allopathy, which is defined as the treatment of a disease by using remedies whose effects differ from those produced by that disease. This is the principle of mainstream medical practice, as opposed to that of homeopathy– a complementary disease-treatment system in which a patient is given minute doses of natural substances that in larger doses would produce symptoms of the disease itself. There is no doubt that introduction of antibiotics (e.g. Penicillin), revolutionised medicine and remains one of the most important milestones in the history of medicine. However, as observed by some critics, the concentration in modern medicine on fighting germs using antibiotics has tended to ignore the “soil upon which the bacteria flourish[iv]” In other words modern medicine tends to focus on the disease not the whole person, as is the case in traditional systems of medicine. “Modern medicine seems too grounded in the study of disease [pathology] and in its eradication and not enough in studying health and how to create and sustain it”. This in fact, is where the great divide exists between modern medicine and African traditional medicine. The World Health Organization estimates that 80% of the populations of Asia, Africa and Latin America use traditional medicine to meet their primary health care needs. For many people in these countries, particularly those living in rural areas, this is the only available, accessible and affordable source of health care. In scenarios such as these African governments should have no option but to ensure there is collaboration between conventional and traditional health practitioners. To this end, Ministries of Health need to set up mechanisms for the regulation and integration of traditional medical practice in national health systems. The 50th Session of the WHO Regional Committee for Africa which took place in Ouagadougou, Burkina Faso, 28 August to 2 September 2000 recognized the importance and potential of traditional medicine for the achievement of health for all, and set 31st August of every year as African Traditional Medicine Day[i], [ii]. The Regional Committee adopted a regional strategy for the promotion of the role of Traditional Medicine in national health systems, including establishing structures, programmes and offices in Ministries of Health to institutionalize traditional medicine. Currently 39 countries (including Kenya) have set up such offices, and a few training institutions have established departments of Herbal Medicine[iii]. Other examples of collaboration between traditional medical practitioners and modern medical practitioners are to be found in Uganda and South Africa. In Uganda the Traditional and Modern Health Practitioners against HIV /AIDS (THETA[iv] ) have demonstrated the positive impact traditional medical practitioners can make on health care delivery. In South Africa research conducted by AMREF shows that traditional practitioners can play important roles in integrated HIV/AIDS/STI/tuberculosis programs[v]. As we look forward to this year’s African Traditional Medicine Day it cannot be lost on us that the ongoing WHO-led collaboration appears to focus solely on herbal medicine, yet traditional African medicine is a broader concept than that, incorporating (beside use of herbs) divination and healing of physical, emotional and spiritual illnesses. In any case, a large proportion of herbalists also engage in divining causes of illness and providing various solutions to spiritually or socially-centered complaints, in addition to use of plant and animal products. 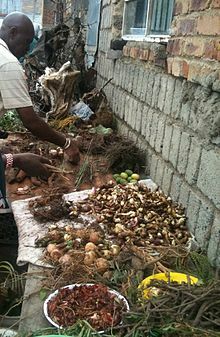 To this extent herbal medicine and spiritual healing act as mutually reinforcing systems of African traditional medicine. Accommodating the holistic approach in the proposed integrated health systems remains a critical challenge for all involved including WHO. [iii] The Kwame Nkrumah University of Science and Technology in Kumasi, Ghana, established a Bachelor of Science Degree in Herbal Medicine in 2001 to train Medical Herbalists. Organization (TA SO) Uganda Ltd and Medicines Sans Frontières (Doctors without Borders), an international humanitarian organization. [v] Melusi Ndhlalambi:Strengthening the Capacity of Traditional Health Practitioners to Respond to HIV/AIDS and TB in Kwa Zulu Natal, South Africa AMREF Case Studies 2009. Reblogged this on Kalunde's Scribbles.